Looking for a tropical Mexican fishing village with relaxing beaches, oceanfront seafood bars and restaurants, unspoiled reefs for diving and snorkeling, and waves suitable for championship surfing? 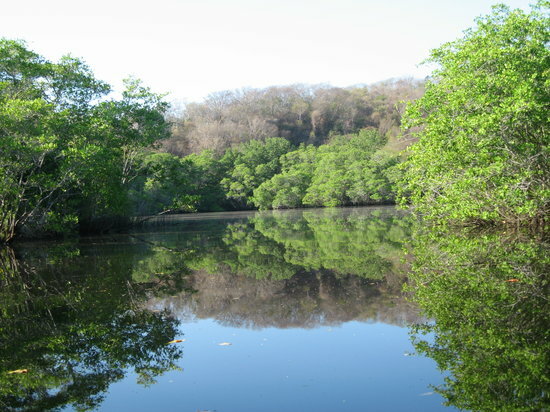 Puerto Escondido has all that plus the Laguna de Manialtepec mangrove lagoon for tours combining kayaking, boating, bird-watching, and swimming in phosphorescent waters. Regularly scheduled airline service links Mexico City and Oaxaca to Puerto Escondido Airport (PXM)Rent an umbrella at the town beach, Playa Principal, which parallels the Avenida Perez Gasga hotel and restaurant row. Stop in one of the hotels near the beach for a drink or take the family horseback riding. A small freshwater lagoon at the mouth of the river, Rio Rigadillo, marks the border with Playa Marinero, which has waves suitable for beginning surfers. The whole family will enjoy the mile-long shoreline walkway known as Andador Escénico, which leads across the rocks to El Faro lighthouse and the Sueño Posible scenic overlook. Beyond the lighthouse, Playa Principal transitions into Playa Manzanillo, a swimmable beach with clear waters extending towards Puerto Angelito. Rent a boogie board or equipment to snorkel the coral and rocks. If Playa Manzanillo gets too crowded on a holiday weekend, catch one of the water taxis linking Puerto Escondido’s seven beaches. Hire a skiff to take the family sightseeing or dolphin and sea turtle viewing. Fish for trophy sailfish or catch a dinner of yellowfin tuna, mahi mahi (dorado), grouper, roosterfish, mackerel, or snapper. Watch the experts surf the 6-15 foot swells and hollow tubes of Playa Zicatela. International competitions in August and November draw the pros to demonstrate their prowess on the Mexican Pipeline. Snorkel or surf the clear shallow waters beneath the high cliffs surrounding Playa Carrizalillo. High red cliffs, housing, and hotels surround riptide-plagued Playa Bacocho, which is good for long romantic beach walks and sunsets. For more adventure, dive Pressure Point’s tectonic plate fault lines or Punta Colarada’s volcanic overhangs, ledges, and lava rock swimthroughs. If you are lucky you will see lobsters, stingrays, moray and snowflake eels, barracudas, yellow tangs, parrotfish, and puffers.